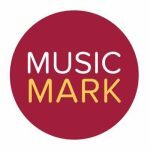 A 'three-in-one' safeguarding training course written specifically for the music education sector in line with inspection requirements, and developed in conjunction with Music Mark, the UK Association for Music Education who represent government funded music services across the country. This safeguarding course enables leaders to train staff in child protection, e-Safety and Prevent training. A valuable tool for leaders and managers who want to instil a 'culture of vigilance'. I am teaching children at home, do I need to take this safeguarding course? This safeguarding course contains detailed modules on recognising signs of abuse and neglect and how to report concerns. It addresses the unique issues that arise from being a lone worker. I work in a school that doesn’t provide music education exclusively. Is this the correct safeguarding course for me? 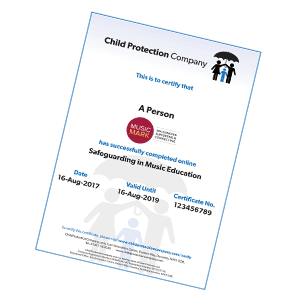 Our online Safeguarding in Music Education training course is written specifically to meet the needs of staff working in the music education sector, but if you work in a general school environment, you might find our Safeguarding in Education course more suited to your needs. We are based in England/Wales/Scotland/Northern Ireland. Is this safeguarding course suitable for our needs? Yes, this course is suitable for people working anywhere in the UK. We provide regional variants of our online Safeguarding in Music Education training course for England, Wales, Scotland and Northern Ireland. This course provides an introduction to safeguarding and child protection and how that can relate to music education specifically. It focuses on a range of safeguarding issues, including abuse, radicalisation, online safety and other associated areas. The content will offer guidance on how to take action in relation to safeguarding and it is suitable for anyone working in music education or tutoring. Music education can generate a very different set of circumstances than general education, so it is important to consider child protection in relation to these environments. This short, scenario-based module is designed to help you assess your current knowledge and begin thinking about issues surrounding abuse and safeguarding that may manifest. It is a sad truth that child abuse, radicalisation, cyberbullying and child sexual exploitation all still commonly occur in the United Kingdom. This module will introduce you to the terminology of safeguarding and define key words and concepts that will inform the rest of the course. By the end of the module, you will have an increased awareness of those most vulnerable to abuse, on what scale abuse occurs, and the definitions of key terms such as ‘child’, ‘young person’ and ‘safeguarding’. Over the years, a number of pieces of legislation and guidance have been implemented to help safeguard and protect children and young people in the United Kingdom. The purpose of this module is to help you understand what legislation is in place and why it is needed. You will not be expected to be able to quote the laws themselves, but it will help with good safeguarding practice if you have an overview of them. It is vital that all staff understand the role of the Designated Safeguarding Lead Person (DSL). By the end of the module, you will have a better understanding of the main safeguarding-related legislation and guidance. You will also consider the vital role played by the DSL in ensuring effective safeguarding takes place. The module will also look at the lone-working aspect of music education. This module will support your ability to recognise those children and young people who are potentially at risk. You will look at what safeguarding is concerned with and it will help you to define the main types of child abuse. It will then move on to consider the specific categories of abuse. This module looks at the role safeguarding should have when it comes to online safety. The content will give you an overview of the potential for risk when children are online in relation to, amongst other areas, grooming, sexting and cyberbullying. The module will also remind you of the legal position should you be made aware of an incident, and will outline ways of empowering children and young people to be safe and report issues when online. By the end of the module, you will have extended your knowledge of the risks associated with technology, the different aspects of online safeguarding in music education, specific risks children may be exposed to and effective online safety practice. All education providers have a legal duty to protect children and young people from exposure to extremism. This module places the Prevent strategy in the context of the music education environment and considers the way in which radicalisation can affect a child, and the groups that may attempt to induct a young person into their ideology. By the end of the module, you will have a greater understanding of the signs of radicalisation and what to do should you feel a child or young adult is in danger under the Prevent strategy. At the end of this module, you will have a better understanding of the signs of physical, emotional and sexual abuse, and neglect. You will also have an outline of the professional responsibilities expected of music education professionals. The focus when working on safeguarding or dealing with a potential abuse scenario must be the safety of the child. Maintaining a child focus is key to the process of identification & reporting because, statistically, it is sadly the case that children sometimes report several times before any action is taken. The learning you complete in this module will be contextualised in a realistic situation so that you can see how a ‘child focus’ can be achieved. By the end of this module, you will have a better understanding of what it means to be child-centred in your approach. You will understand the responsibilities placed upon those who work with children and young people in relation to documenting decisions made and actions taken. You will now take all that you have learned and apply it to an assessment of your knowledge. The final assessment is your opportunity to show how much you have absorbed and why it is so important to have child protection and safeguarding training.